Although many kinds of alkylating agents have been traditionally used as anti-cancer therapeutic agents, numerous studies have reported that alkylating agents can cause tumors due to genotoxicity, and that the DNA repair systems are strongly involved in expression of anti-carcinogenic and genotoxic functions [1–4]. In many cases, alkylation such as methylation, ethylation, or chloroethylation, at the O6 site of guanine causes DNA lesions that induce cytotoxicity and genotoxicity. 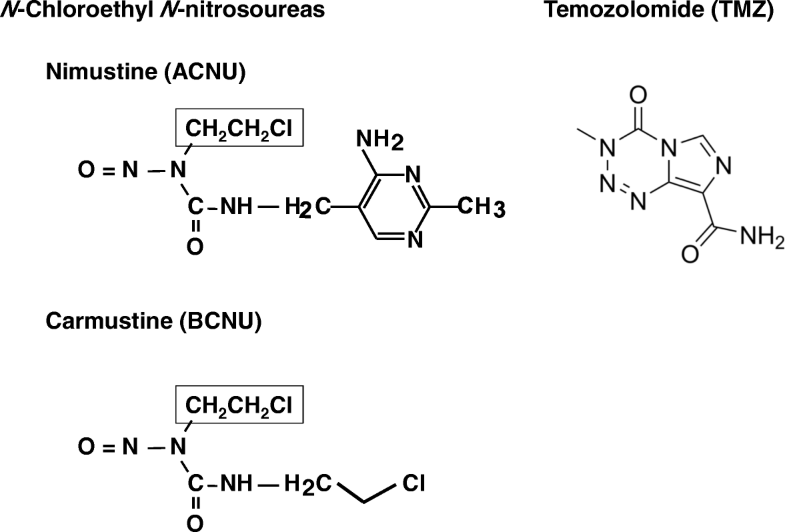 Chloroethylnitrosoureas (CENUs), such as nimustine (ACNU) and carmustine (BCNU), are typical chloroethylating agents that are employed in tumor chemotherapy for treating several kinds of tumors, including lymphomas, melanomas, small cell lung cancer, Hodgkin disease, and cerebromas [5, 6]. The blood-brain barrier is a major obstacle in therapies for brain tumors , and since CENUs can cross the blood-brain barrier, they are useful and important as chemotherapeutic agents against brain tumors . CENUs are thought to cause chloroethylation at several DNA sites, and among them, O6-chloroethylguanine is considered to be the most influential lesion in causing cytotoxicity and genotoxicity . Alkylation of the O6 site of guanine is well-known to cause a base substitution from GC to AT . O6-Chloroethylguanine is unstable and immediately transforms into N1-O6-ethenoguanine via circularization of its molecule as an intermediate to form an interstrand cross-link (ICL) between guanine and cytosine . ICLs strongly inhibit DNA replication , and these ICL lesions are considered to be responsible for the cytotoxic effects of CENUs [4, 5]. However, ICLs might trigger not only cytotoxicity, but also genotoxicity, leading to tumor formation as a side effect of the chemotherapeutic treatment [5, 11, 12]. The involvement of O6-alkylguanine-DNA alkyltransferase (AGT) in the repair of chloroethylating guanine has been widely reported [6, 13–15]. Recently, the mechanism of ICL-repair as well as the cytotoxic effects of ICLs has been slightly clarified . Previously Wiencke and Wiemels reported that BCNU was weakly mutagenic in Ames test using Salmonella typhymurium hisG46 and TA1535 that detect the base substitution from G to A . However, the relationship between the genotoxic lesions and mutagenesis remains unclear, and its repair pathway remains to be fully elucidated. 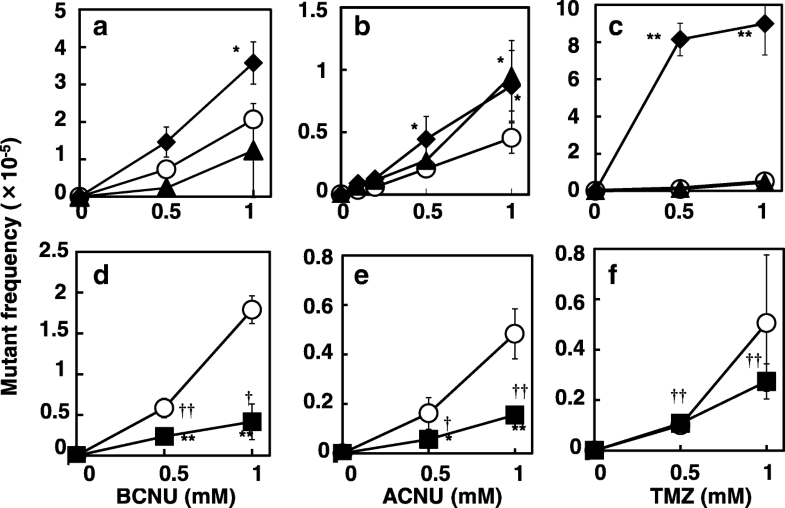 In this study, we examined the mutations induced by ACNU and BCNU in E. coli strains CC101 to CC111, which can be used to detect reverse mutations due to each episome from F’101 to F’106 and frameshift mutations due to each episome from F’107 to F’111 [17, 18]. The mutantion frequency increased only in the E. coli CC102 strain, in which a GC to AT mutation was detected. In an exception, BCNU was mutagenic in E. coli CC104 strain only at high dose. Frameshift mutations were not detected in assays using strains CC107 to CC111. To determine the pathway responsible for repairing the CENU-induced lesions, we examined the frequencies of mutations induced by CENUs in the ada, ogt (AGT)-deficient strain, uvrA (NER)-deficient strain, mismatch repair (MMR)-deficient strain, recA (recombination)-deficient strain, and uvrA and recA double-mutant strain of CC102. 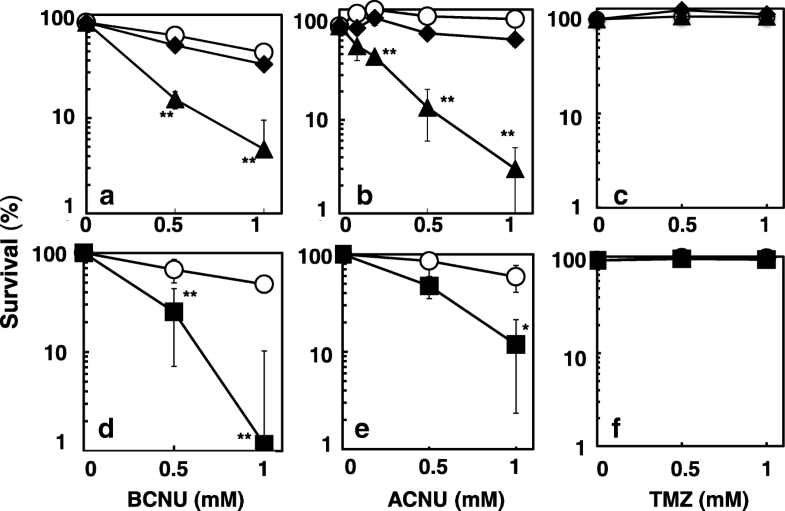 The frequencies of mutations induced by ACNU and BCNU were elevated in the ada, ogt strain, indicating that O6-chloroethylguanine was formed, then repaired in part by AGT. The pathway for ICL repair is complicated, and it might be related to recombination. A significant decrease in survival was observed in the double-deficient uvrA, recA strain, while the mutant frequency was similar to that of the NER single-deficient strain, suggesting that in E. coli, NER and AGT prevent GC to AT mutations, and that NER and recombination independently prevent cytotoxic effects. We also examined whether MMR is involved in the repair of DNA lesions induced by CENUs, because it is well-known that MMR pathway involves in the processing alkylated guanine lesions by repair or cytotoxic effects [23–26]. Our results demonstrated that MMR was not responsible for the repair of chloroethylated lesions (Table 3). Thus, chloroethylated guanine does not appear to be a target for MMR. Chloroethylnitrosoureas (CENUs), such as ACNU and BCNU, are typical chloroethylating agents that are employed in tumor chemotherapy, especially for brain tumors due to their ability to pass through the blood-brain barrier . CENUs cause the formation of O6-chloroethylguanine, followed by the formation of an ICL via N1-O6-ethenoguanine, and this ICL lesion blocks replication, leading to the cytotoxic effects of the CENUs [3–6]. However, these lesions are considered to be a double-edged sword, because they can also be genotoxic and mutagenic, and can lead to tumor formation. Unfortunately, the genotoxic mechanism of CENUs remains unclear. In this study, we examined the mutagenic effects induced by CENUs and the systems that repair the mutagenic DNA damage using an E. coli reversion assay system. This system can detect sequence-specific mutations easily. Previously, Tashima et al. 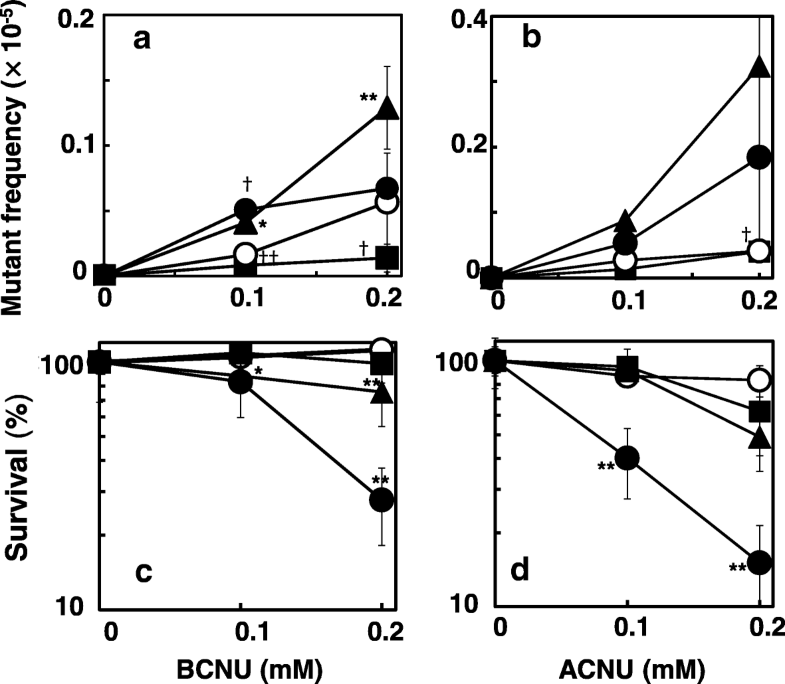 reported that recA-lacking E. coli was very sensitive to BCNU, and that the lesions induced by BCNU are likely repaired by post-replication repair, that is, homologous recombination ; however, although they observed the cytotoxic effects of BCNU, they did not examine the mutations induced by BCNU. In our study, we first investigated the mutation spectrum caused by ACNU and BCNU using E. coli strains CC101 to CC111. The results showed that both chemicals induced GC to AT transition mutations in the CC102 strain, suggesting that chloroethylation occurred at the O6 position of guanine, because it has been reported that O6-chloroethylguanine induces GC to AT transitions via mispairing (reviewed in 3). These results are corroborated by previous reports that the toxicity of alkylating agents increased in cells lacking AGT or O6-methylguanine-DNA methyltransferase (MGMT) [2–4]. These results are in agreement with our data showing mutagenicity in S. typhymurium TA100. The therapeutic efficiency of ACNU for tumors is dependent on the MGMT expression status in tumor cells . ACNU-induced sister chromatid exchanges were efficiently protected in HeLa cells transduced with human MGMT . Preuss et al. observed that the protective effect of MGMT against cytotoxicity was specific to certain agents, that is, MGMT showed stronger protection against the cytotoxic effects of ACNU than those of BCNU in HeLa cells . In addition, Becker et al. reported that skin tumors induced by topically applied ACNU were protected from cytotoxicity when human MGMT was expressed in the mice skin . We observed a significant increase in the frequency of mutations induced by BCNU and ACNU in ada, ogt E. coli; in the case of ACNU, the mutant frequency was similar to that in the uvrA strain, while the frequency of mutations induced by a methylating agent, TMZ, was markedly elevated in the ada, ogt strain (Fig. 2). These results are in agreement with previous reports that O6-methylguanine is efficiently repaired by AGT, which we also confirmed using a series of repair-deficient E.coli CC102 strains . However, from the present results, it appears that chloroethylation might not be as efficiently repaired by AGT as methylation at the O6 position of guanine. Previously, Mazon et al. revealed that in E. coli, an alkyltransferase-like protein prevents the toxicity that is induced by slightly larger O6-alkylG adducts through the enhancement of NER and inhibition of futile MMR cycles [31, 32]. In the present study, the lesions induced by ACNU appeared to be partly repaired by NER, because the frequency of mutations induced by ACNU in the NER-deficient (uvrA) strain increased to a similar level so that in the ada, ogt strain (Fig. 2b). Numata et al. reported that some steps of NER are involved in repairing ACNU-induced DNA damage in ACNU-sensitive CHO cells . In our results, the frequency of mutations induced by BCNU was not affected by NER deficiency at higher doses of BCNU, but it appeared to be affected at lower doses. This suggested that CENU-induced lesions might be repaired not only by AGT, but also by NER, and ACNU might cause the formation of some bulky adduct, which are mainly repaired by NER.